Each year after a competitive interviewing process, 25 incoming freshmen are accepted into The Citadel Honors Program. 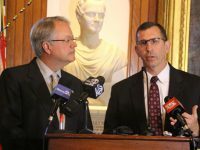 Due to the unyielding military, physical fitness and leadership training requirements comprising the college’s fourth class system, this commitment adds increased academic rigor to what is already one of the most demanding college freshman experiences in America. The process of transforming a cadet private into a recognized member of the South Carolina Corps of Cadets takes many months and great effort, but, according to four Golf Company Honors Program freshmen, William Metts Jr., John Simone III, Akhil Prathipati and Martynas Tendzegolskis (from Lithuania), the rewards are already considerable. What is the hardest thing about being a freshman and making it through to Recognition Day? 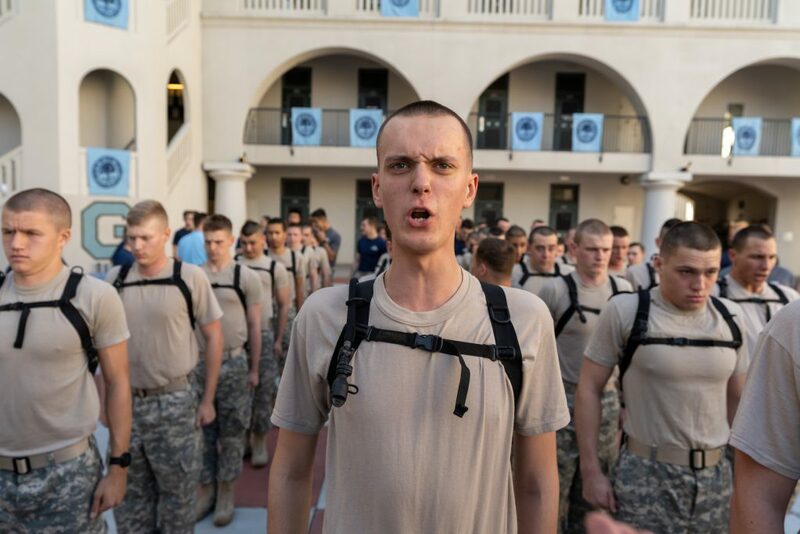 Tendzegolskis: The hardest thing about being a freshman is no specific “thing.” Rather, it is the combination of all of the military duties, academics, and personal pursuits that makes The Citadel challenging. If not for the academics, I know I would have excelled at all cadet and military duties. If not for the military duties, my academics would have caused a great deal less stress. I have a very intense academic schedule between the Honors Program and a double major so for me, organizing my time for was a great challenge up. This grind, combined with too little sleep pushed me to my mental and physical limits. I feel I am better off for it. My time management has improved and I have become more resilient. 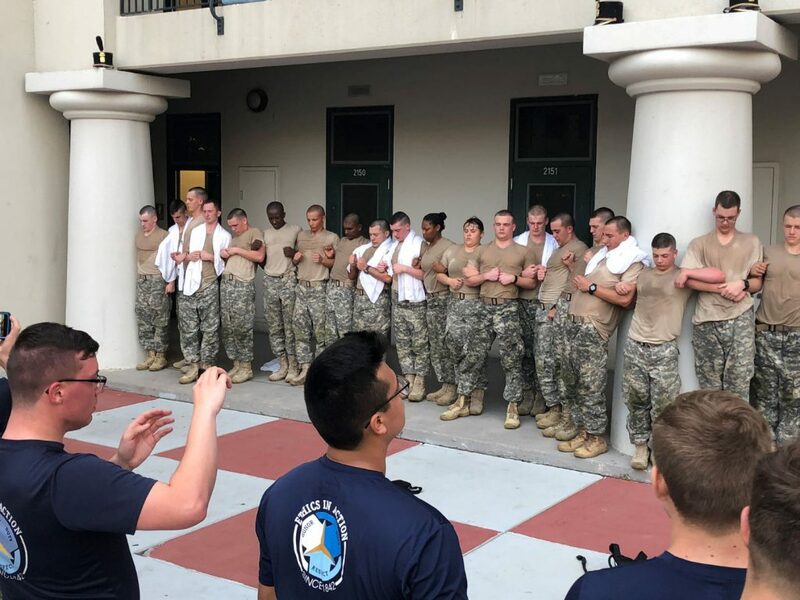 Metts: The most difficult thing about making it through to Recognition Day is learning that everything at The Citadel is done a certain way for a reason. There are many instances day-to-day where things could be done more efficiently, but the experiences and tasks are that way for a reason and promote class bonding. Prathipati: Managing elevated academics with cadet responsibilities was definitely a challenge. Simone: At the Citadel, one aspect of cadet life that is important to success is time management. 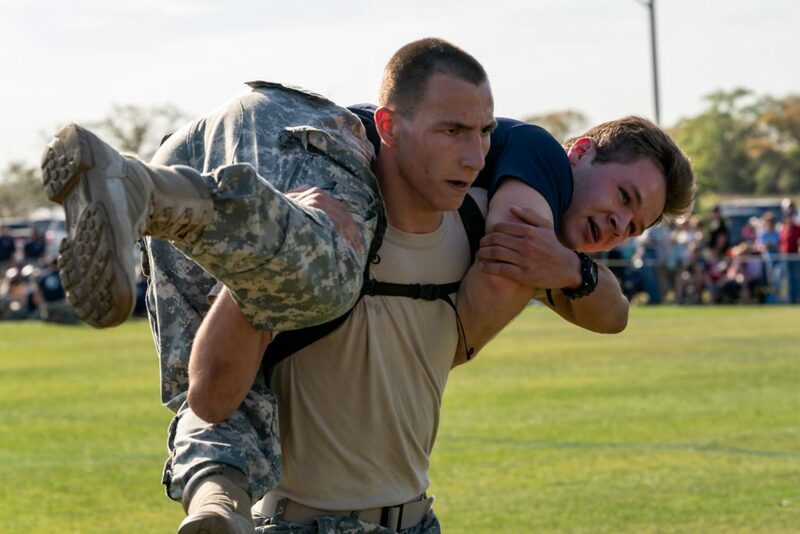 The Citadel challenges cadets to develop their character, military, academics, and fitness. It is important that a cadet at The Citadel challenges themselves to become proficient in all of these aspects. 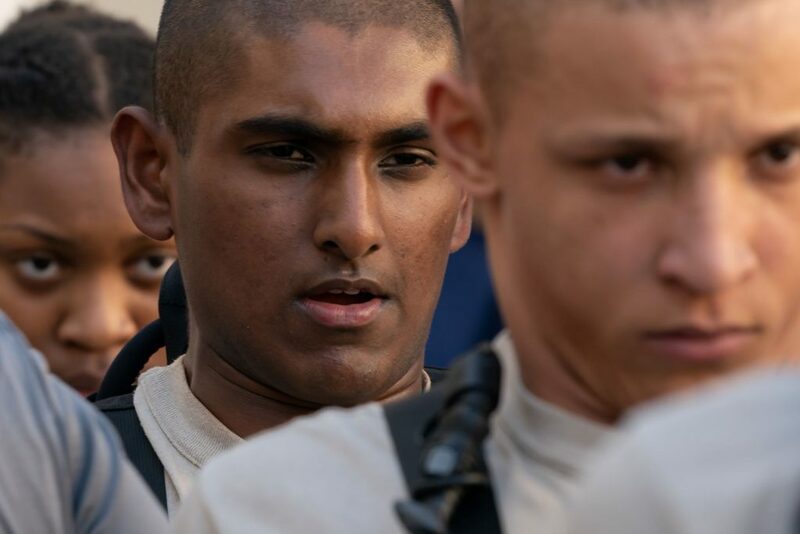 At times, especially the beginning, managing all of these responsibilities is daunting, however, developing these characteristics allows cadets to become better prepared to overcome future challenges. 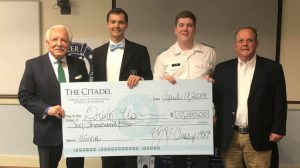 What is one of the most rewarding aspects of attending The Citadel as a freshman? Cadet John Simone III (left), with Honors Program classmate Cadet William Metts Jr.
Simone: The most rewarding part of knob year is the connections that one develops with their classmates. 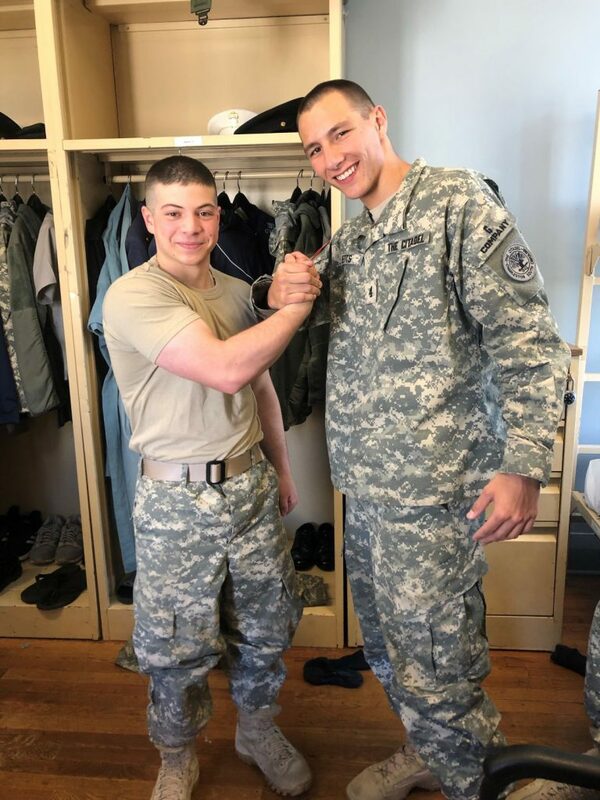 The only way to make it through the challenges cadet privates face their first year is to rely on their classmates, developing many strong connections. Working together through the tasks that cadets face each day develops trust. Prathipati: Recognition Day itself is the hardest, most definitely, including the gauntlet obstacle course and all of the work leading up to it. While it is the most dreaded day of all, it is very rewarding because we’re inspired to get through it knowing we’ll soon experience the other side of cadet life. Later, we will reminisce about freshman memories with fellow classmates. Metts: The most rewarding aspect of The Citadel is the bonding between classmates felt both in the Honors Program and Golf Company. I would go up to bat for any of the people I’ve made relationships with over the last eight months. I’ve never been a part of a group this like minded and driven. Tendzegolskis: The most rewarding thing about Knob year is looking back at yourself as you were during Matriculation Day and comparing that to the person you have become. As someone who could have been better in terms of both discipline and physical fitness, the changes, at least in my mind, are staggering. When I first arrived at the Citadel I was concerned that I would not be able to pass my physical fitness test (though I did). Now I have my sights set on eventually maxing the PT test. Why is being in the Honors Program important to you? Prathipati: The honors program offers a unique experience like no other. it allows me to flourish alongside highly ambitious students who seek to not only excel as cadets, but to see theirs peers succeed. I feel driven to succeed with such an encouraging community. Tendzegolskis: Simply put, if I was not in the Honors Program, I would not be here. Without the Honors Program scholarship I could not even dream of coming here. 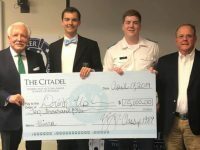 The Honors Program has granted me a very unique opportunity – the opportunity of pursuing my life and career goals (service in the Lithuanian military, and a later career in NATO), while gaining a college degree at an institution as reputable as The Citadel. I am proud of the fact that I am the first foreign cadet to receive the full-ride Citadel Scholars Scholarship, and the second foreign Honors Program student in the history of the Citadel. On top of this, the Honors Program grants me the ability to push myself to the limit academically. The Honors specific courses I have taken, and the professors that have taught them, have influenced me greatly. Thought the courses are rigorous and challenging, I can say they are well worth it for the amount of knowledge and experience I am getting. Simone: The Honors Program gives me many opportunities to advance my education in a challenging environment that encourages me to work through problems and develop new ideas. The professors specific to the program present us with challenges that encourage us to use critical thinking. Metts: The Honors Program is important to me because it takes me out of my comfort zone to push the limits of my potential. 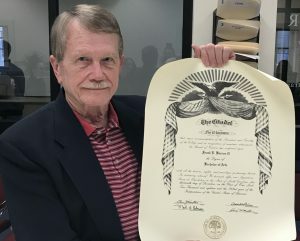 I really did not know what I was capable of until I began working with the instructors in the program who give us one to one assistance. How is your cadet experience helping shape you as a future leader? Metts: My cadet experience has removed all doubt and fear of the future from my life. While the process is entirely humbling, it also breeds confidence. I believe this levelheaded confidence will set me apart as a leader in the future. Prathipati: At the most challenging of times, the cadet experience drives you internally to become a compassionate leader which I believe is an essential component in the development of a competent, future leader. 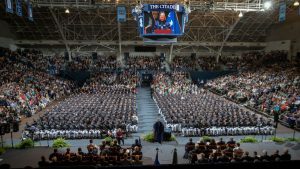 Simone: At The Citadel it is not possible for a cadet to simply excel in just one facet of cadet life in to be successful. This complexity prepares cadets for life after The Citadel when we will have responsibilities in addition to our careers. It will prepare us to work through problems that we will eventually face in our personal and professional lives. 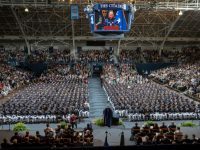 Tendzegolskis: The most important part of The Citadel experience in terms of shaping future leaders is that it forces everyone to follow before they can lead. Throughout my life, I led whenever I could: in high school I would jump at every opportunity to lead. I enjoyed working with people, understanding their strengths and weaknesses, and attempting to unite them for a common purpose. The issue with this was the fact that I had an aversion to following. The Citadel has granted me the opportunity to change this. Knob year teaches you to follow, to watch others as they lead, to take orders and accomplish tasks, to see the direct consequences of leadership, and work as a part of something larger than yourself. It is not possible to be a successful leader without understanding how to follow, or without understanding how your subordinates will feel about the decisions you make. I think this experience, together with the next three years of gradually expanding leadership roles and opportunities will shape me into a far better leader than I could have ever been otherwise.